Use the healing powers of salt from the Dead Sea to improve your health and general well-being. Inhale deeply in our salt grottos and experience the same relaxation of body and mind as in a holiday by the sea. Aside from promoting physical health, a stay in our salt grottos benefits body and soul and helps by concentration and immune deficencies, migrane headaches and sleeplessness. 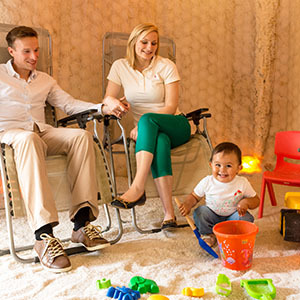 Children can enjoy the healing effects of inhaling Dea Sea salt air in our special family grotto. Important: If you have thyroid problems, please consult your doctor before comming, especially if you intend multiple visits to the salt caves. Both of our Dead-Sea-salt grottos in our thermalbathhouse can bei used for quiet relaxation für singles and families with kids. In addition zu our quiet salt grotto, we also have a special family grotto für grownups and children: Kids can play here quietly while inhaling the beneficial salt air, as parents relax. Grownups with their children enjoy our special family-prices! Daily from 8.30 a.m. til 7.30 p.m.
A use lasts 45 minutes. We recommend booking ahead of time: Phone 0671 991432. With this prepaid card you will receive a rebate of the applicable regular admission prices. Order and print your gift certificate at home in our online-Shop . You can find directions to Bad Kreuznach on www.bahn.de, and www.rnn.info will provide you with up-to-date bus schedules. The Crucenia Dead Sea salt grottos are just under 100 metres from Badeallee bus stop and are situated in the centre of the signposted spa district. You can park in the car park "Parkhaus Kurviertel" at the entrance of the spa district, only about 200 meters away from the salt grottos. Salt grotto visitors can park here up to four hours for only 1 Euro. Make sure you habe your parking ticket validated at the crucenia cash desk when you leave. You can also park directly in front of the thermal bathhouse at the "Kurhaus Parkplatz". To park here, you will have to pay 1 Euro for up to one hour and 2 Euro up to four hours, als long as you are visiting the salt grottos. Again, you remember to get your parkticket validated at the crucenia cash desk when you leave.